The days of summer may have come to an end now, but that doesn’t have to mean the end of family activities for you and your kids. The new season just brings new fun things you can do together. If you’re struggling for inspiration, read on for a few of our favourite ideas for spending quality time together during the autumn months! Getting wrapped up nice and warm and heading out for a walk in the autumn is one of the most wonderful things to do once the seasons change. Your favourite spots from the summertime will look completely different and it’s a wonderful way to help children get in touch with nature and learn about the changing seasons. Encourage your children to point out things in familiar places you visit often that look different now that the seasons are shifting. 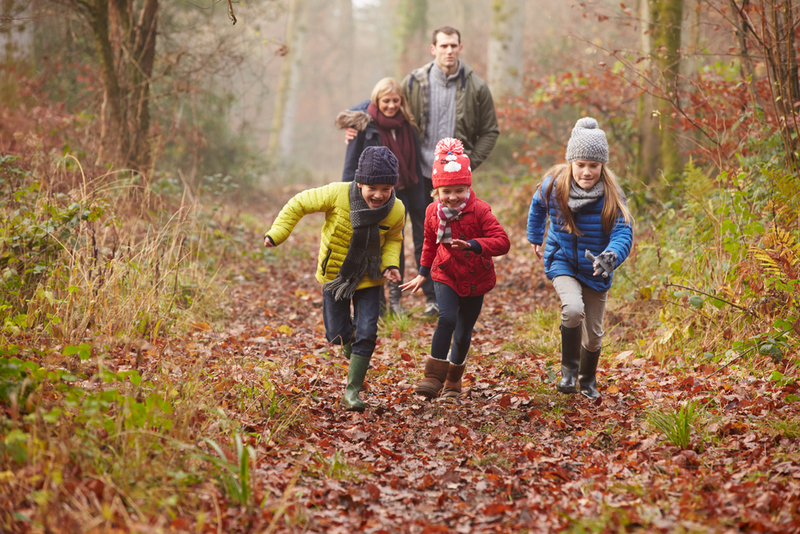 If you’re in the Lake District or planning to visit one of our Lake District parks soon, here are a few fabulous autumn walks recommended by National Trust Countryside Rangers! Our Fell End and Hall More parks are situated in the Arnside and Silverdale Area of Outstanding Natural Beauty, which is the perfect place to visit in the autumn time if you’re a lover of nature. Arnside village faces the estuary of the River Kent at the top of Morecambe Bay, and there are shops, galleries, pubs and cafés, as well as the National Trust-owned Arnside Knott, which is perfect for an autumn walk. There are also many woodland walks to enjoy around the Knott where you can take in the autumn colours as well as views across the bay to the Lakeland fells. Silverdale Cove is a lovely beach walk with a coastal path, and caves to explore, which little ones will love. Nature lovers can also visit our very own Fell End Nature Reserve, as well as nearby RSPB Leighton Moss. If you’re lucky, you may even catch the starling murmuration from October! If you want to go a little bit further afield, a family bike ride is a lovely way to get outdoors and get some exercise, while marvelling at the changing autumnal tones around you. Plan a route, wrap up warm, and head out for a day of fun together. Maybe schedule in a trip to a nice cafe to refuel anybody who might be low on energy. As the weather gets colder and a little bit more miserable, planning indoor activities for your family to enjoy is a great way to make sure you still get out of the house. Heading to a museum together is a great activity that will allow them to explore new ideas, cultures, or experiences. It’s great for their education, while also being lots of fun at the same time and of course, it’s a great excuse to get out of the rain. No matter where you live, you’re sure to have some fantastic museums nearby that are suitable for children. Collecting conkers is something that children have been doing for generations and it’s a lovely thing to do with yours to teach them about the things you enjoyed doing when you were little. There’s also plenty to learn, such as how to know when conkers are ready to collect. Conker battles should be carefully supervised to make sure no little ones end up getting hurt, but they are a lot of fun and the process of finding and preparing the conkers is enjoyable in itself. Making a nice hearty soup from seasonal veg now that they’re in season is a lovely way to warm up when you come in from a day outside in nature, or even a great rainy day activity. It’s a great way to get the kids in the kitchen helping you out, and it’s fun to make something together! Autumnal soups such as butternut squash are always a winner, or you could even incorporate pumpkin or squash carving around Halloween with making a nice warming soup! When it’s really miserable outside, it can be a nice excuse to stay indoors where it’s warm and cosy and get creative for a little while. Why not get the paints out and encourage your little ones to paint an autumn scene, inspired by the changing colours outside? You’ll keep them occupied for a while until you can get back outdoors to let off some steam and you’ll have some lovely paintings to stick up on the fridge! Why not take inspiration from the changing seasons and head away for a bit of a change of scenery with the family? You can enjoy exploring somewhere new and there’s no reason why you should only holiday during the summer months! Why not check out the availability at one of our parks across the country and head off to the Lake District, explore the Norfolk Broads, or discover one of our other great locations? There’s plenty to do at all of our parks, with local attractions, on-site leisure complexes, entertainment and play areas, so you won’t have a dull moment, whatever the weather.